Rep. Bart Stupak: The Democratic congressman was speaking on the House floor Sunday night, shortly after the chamber passed the sweeping health care reform bill with his help, when someone yelled "baby killer." Members of Congress groaned, and someone shouted, "Who said that?" Stupak had opposed the bill over its abortion language until he reached a deal with the White House on Sunday. 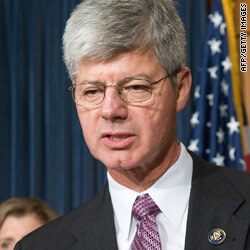 Just days earlier, Stupak, D-Michigan, was a hero of anti-abortion House Republicans who opposed the bill. After he announced his support for health care reform legislation, an organization opposing abortion rights withdrew an award it had planned to present Stupak. The Susan B. Anthony List had chosen Stupak to receive the "Defender of Life" award at the "Campaign for Life Gala" Wednesday in the nation's capital. "By accepting this deal from the most pro-abortion President in American history, Stupak has not only failed to stand strong for unborn children, but also for his constituents and pro-life voters across the country," Marjorie Dannenfelser, president of the Susan B. Anthony List, said in a statement shortly before the House was set to vote on the controversial bill. In reaction to the award being rescinded, Stupak said, "I didn't seek the award. I stood on my principle. I don't need an award." Rep. John Lewis: The civil rights leader and Georgia congressman said demonstrators against the health care bill yelled racist epithets at him and Rep. Andre Carson, D-Indiana, as protesters walked past them on Capitol Hill on Saturday. Witnesses said demonstrators hurled the N-word at the congressmen multiple times. "I haven't seen or heard anything like this in more than 40 years, maybe 45," Lewis said. "Since the march from Selma to Montgomery really." "I've faced this before. So, it reminded me of the '60s. There's a lot of downright hate and anger, and people are just being downright mean," he said. Andrew Langer, the president of one of the groups that sponsored Saturday's protest, issued a statement Sunday condemning the incidents. "The Institute for Liberty roundly condemns the isolated incidents of intolerance that occurred. ... As a core value, the Tea Party movement believes in the precept upon which our independence was declared and this nation was founded: that all men are created equal." Lewis, 70, risked his life many times on Freedom Rides in the early 1960s when he challenged segregation at interstate bus terminals and sat in seats reserved for white patrons. According to his Web site biography, "he was also beaten severely by angry mobs and arrested by police for challenging the injustice of Jim Crow segregation in the South." In 1965, he led a group of 600 protesters who had intended to march from Selma to Montgomery, Alabama, to demonstrate for voting rights. The marchers were attacked by local and state police. The confrontation is now known as "Bloody Sunday." The march went ahead two weeks later. Vicki Kennedy: The widow of Sen. Edward M. Kennedy and co-founder of The Edward M. Kennedy Institute for the United States Senate saw her late husband's dream realized on Sunday. At the Democratic National Convention in 2008 - just three months after he was diagnosed with brain cancer - the longtime Massachusetts senator called health care for all "the cause of my life." The couple were married in July 1992. Their families were longtime friends, and Vicki Kennedy had once been an intern in the mailroom of her husband's Senate office, according to TIME magazine. Vicki Kennedy is scheduled to sit down with John King for an exclusive interview on the first edition of "John King, USA" which premieres tonight on CNN at 7 ET. The institute she helped to create is a nonprofit organization "dedicated to educating the general public, students, teachers, new Senators, and Senate staff about the role and importance of the Senate." Ali Noorani: Tens of thousands of people turned out on Washington's National Mall on Sunday to support the Obama administration in its next big battle, a renewed effort to overhaul U.S. immigration laws. "You are a spectacular sight," Ali Noorani, chairman of the coalition that organized the demonstration, told the crowd. Noorani said the rally had drawn more than 150,000 people "from across the country, and we are demanding comprehensive immigration reform now." Though overshadowed by the historic debate on health care taking place in the nearby halls of Congress, Sunday's rally set the stage for a revival of efforts to reshape U.S. immigration law. The issue has been largely sidelined since 2007, when the Bush administration's push to establish a path to legal citizenship for the estimated 11 million people illegally in the United States foundered in Congress. Noorani is executive director of the National Immigration Forum, a leading immigrants' rights organization. Benjamin Netanyahu: Israel's prime minister will meet President Obama in Washington on Tuesday and will also make a speech to an influential pro-Israel lobbying group, at a time when United States-Israeli relations are more strained or stronger than ever, depending on your point of view and the expert you ask. Netanyahu, who will address the American Israel Public Affairs Committee and members of Congress at a dinner Monday night, is visiting the United States soon after Israel was criticized for the announcement that it was planning to build 1,600 new housing units in a disputed area of Jerusalem claimed by both Israelis and Palestinians. The announcement was made during Vice President Joe Biden's recent visit to Israel and Netanyahu then ordered an investigation into its timing. I am pretty sick and tired of the rudeness that is infecting society lately. There seems to be an overall sense of entitlement throughout all social levels. People who have achieved a position within our government should know better how to behave! One of the criteria defining "treason" in the US Constitution is giving "Aid and Comfort" to the country's enemies. As an ally, Israel makes a damned fine enemy, thereby, it seems to me, making treasonous any "influential pro-Israel lobbying group." Know what would be hilarious? If after that person asked, "Who said that? ", every Republican, one-by-one, stood up and shouted, "I am Spartacus!" Well Off to pay for all the lowlife that are unwilling to WORK and pay their own way. I for one will not stay and let the president dedistribute my wealth. Based on the protest signs I have seen at many Tea Party rallies, and the the things I have heard them say at these rallies, it's really hard not to conclude that the Tea Party movement is just a re-skinning of the KKK. Sure, not *every* tea partier is like that – some are just crackpots who believe in conspiracy theories like the "birther" movement. But that's two very big strikes against this organization. For the Republican party to embrace them sends me a clear signal that the Republicans have lost their moral authority to lead. those 34 "democrats" who sided with the republicans should resign from their party. shame on them. the republicans at least knows how to be loyal to their party, right or wrong, which in this case is obviously wrong. whoever shouted 'baby killer' and didn't step forward is a coward, plain and simple. rather than be responsible for their own words, they are allowing their stupidity to cast an even worse image on the republican party. It's sad to see how many people slept through English class. The republicans profess to oppose socialism, yet they fall over themselves to throw money at the two largest money drainers on the planet, the US military, where every piece of equipment costs five times its true value and corporate welfare programs that gives trillions in tax breaks to mega corporations and the oil cartel. Truth would be nice for a change. Civility wouldn't hurt either.